Sky acrobats show is classy and beautiful with a unique touch. High in the air, feats of strength and flexibility are performed through graceful and dynamic aerial dance. Feminine strength and grace are presented whilst executing dynamic tricks in the air. Dawn manipulates the rope so that they spins gracefully throughout the act. Breathtaking! Stunning, graceful and lyrical, Dawn performs difficult manouevres while spinning, flying and dancing gracefully through the air. 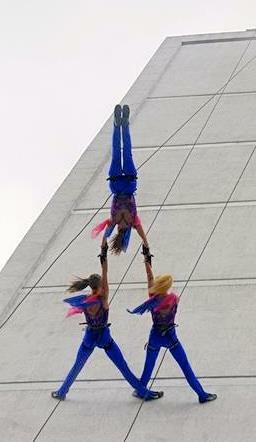 To book Sky Acrobats show for your event entertainment contact our JMStrings Entertainment Specialists today. Our dedicated team of Entertainment Specialists will be more than happy to provide further details on this and other musicians that can play chill out music for events in the Bahrain and worldwide.